We head to the mountains. With 4419m of climbing, this is a proper day in the saddle for the peloton. 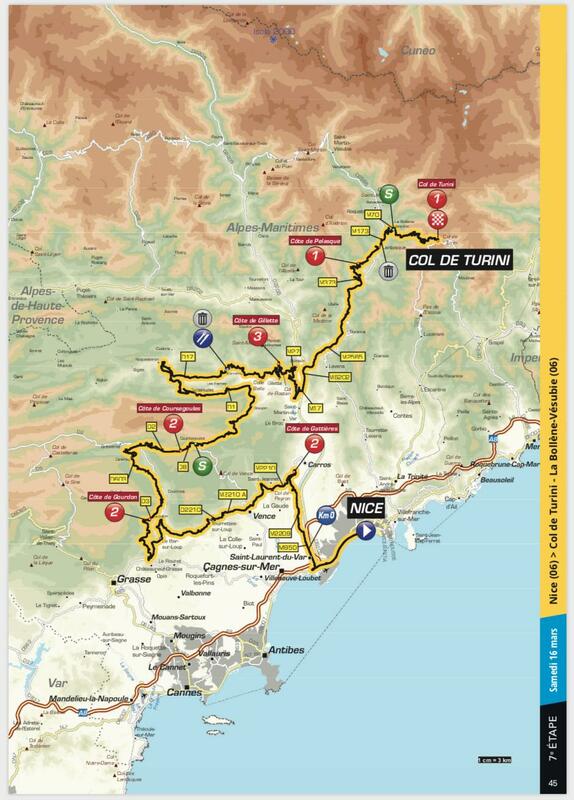 The stage ends with the toughest climb in the whole race, Col de Turini. 15.3km at 7.2% is a tough old mountain. One the plus side for many riders is the fact that it is relatively consistent, allowing most to settle into a nice rhythm, but it also has a number of hairpins which the pure climbers can use to launch attacks. 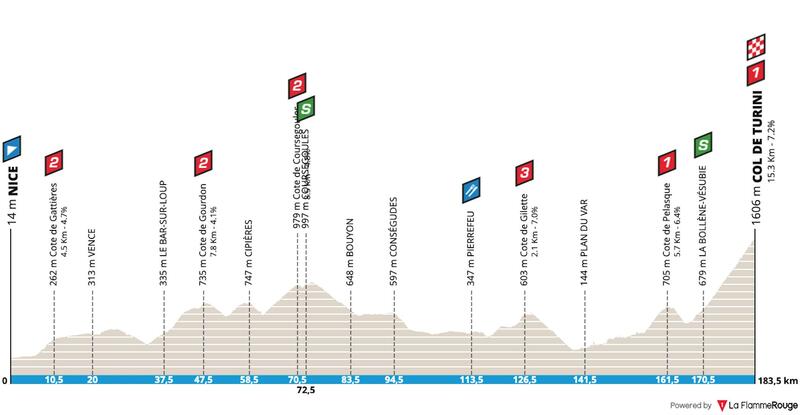 Interestingly, the hardest part of the climb comes in the final kilometre, so it will be important to save some energy as blowing at that point will see a rider drop crucial time. After such a tough week, it will be interesting to see who still has the legs to win this stage. The wind has gone! The peloton can enjoy a sunny day, with a light wind coming from the south. That means sections of the final climb will be a headwind, but it does have many changes of direction. 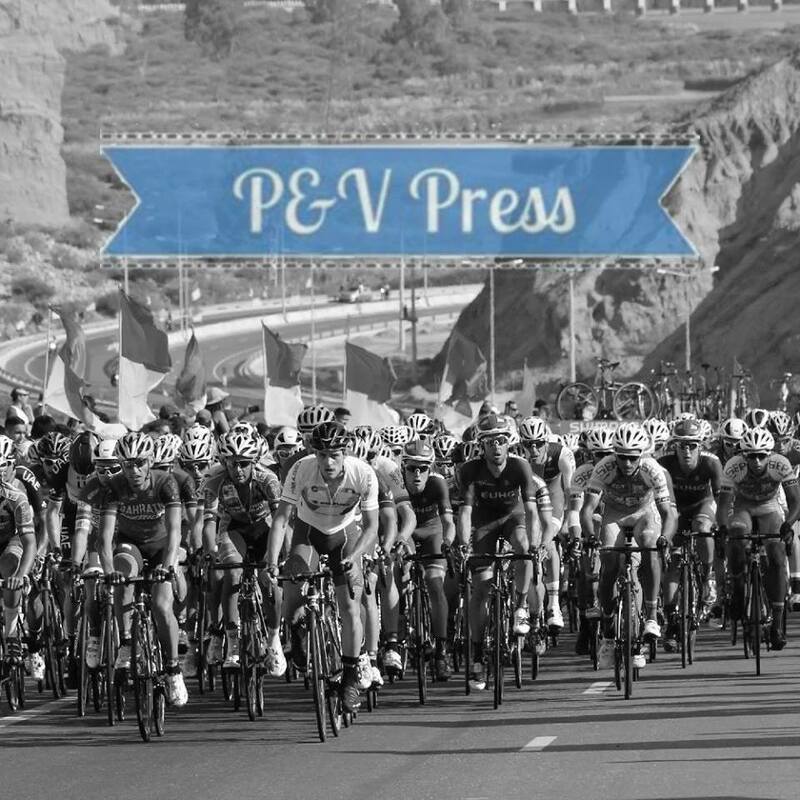 I can’t remember a Queen stage where so many riders were already out of the GC picture, this greatly changes how teams approach the climb. We’ll have a whole bunch of riders down on GC chasing the stage win, but some of the guys still in the GC battle also want to take the stage. Sky only need to concern themselves with a few riders, who’ll do the chasing when the riders further down the GC go on the attack? For those riders, picking the right point to attack is important. This is a long climb, it should take the best around 44 minutes to climb it, there is little point attacking early. It would be wise to let Team Sky do their thing on the front and move with around 5km to go. Saying that, it does depend on the race situation. This is a very difficult stage to get right. What about Team Sky? With Kwiatkowski and Bernal looking unbeatable, how will they approach the stage? Will Bernal be used to cover the moves? Will he stay with Kwiatkowski and help pace him up the climb? Will he cover moves and then refuse to work? Egan Bernal – I’m still trying to work out how he can be so good in crosswinds. Now back in his usual terrain, he’s the rider everyone should be scared of. His team role will be interesting, as Kwiatkowski is the race leader and team captain. As their main threats are 1 minute down, how will the Sky pair approach the race. I think that Bernal will be given the task of following the attacks of Bardet and Quintana, but refusing to work with them. This should leave him nice and fresh for the final kilometre, which will be important. The problem is the the stage could already be gone, as a rider further down on GC could take the win. Will Bernal attack his team leader in the final kilometre and try to take yellow? It wouldn’t be a very popular move. Romain Bardet – a rider who usually saves his best performances for the Tour de France, it’s about time he started to pick up wins in other races. Arguably the best climber in the race, AG2R will be demanding a big performance by their superstar climber. Bardet has started the season in good form and this stage will have been a big target for him, but can he beat the Sky boys? Nairo Quintana – I’ve been impressed by him this week. After a couple of frustrating seasons, it would be great to see the Colombian back on top form. This is a climb that should suit him very well, but he won’t be allowed any freedom by the Sky pair. Simon Yates – out of the GC picture, he’ll be given some freedom by the GC riders. Yates won the Queen stage in Andalucía from a similar position and we can see from the TT that his legs are currently very strong. It will be interesting to see when he attacks, but you can bet he will. Despite the form of Bernal, it’s the Brit who starts as the favourite. Being down on GC will be a huge advantage. Miguel Ángel López – see above! Superman López is in the exact same position as Yates. I expect him to attack and fight for the stage win. George Bennett – he survived the echelons, something I wasn’t expecting. Now in the mountains, the Kiwi will be looking forward to moving up the GC and fighting for stage glory. 2018 was a great year for him, he can now be classed as one of the best climbers in the world. Winning will be tough, but he’ll hope to finish in the top 5. Domenico Pozzovivo – another climber who’s out of the GC picture and hoping for freedom. He was 2nd in Oman, but never really challenged for the win. Now 36 years old, does he have another big performance in him? Michal Kwiatkowski – the former world champion knows this climb very well, sometimes it’s lucky to live in Monaco! Having climbed it just a couple of weeks ago, he’ll be hoping his local knowledge gives him an advantage over his rivals. The steady nature of the climb is perfect for his climbing style and he’ll be confident of staying with the main group and holding onto the yellow jersey. Some might think this climb is too hard for him, but I disagree. He’s been hugely impressive this week and I have no reason to doubt him. Come on people, we’ve been here before. Given his position on GC, this has to be a stage for Simon Yates. Just like his win in Andalucía, I think we’ll see him break clear of the main group and they’ll have no reason to chase him. Bardet better climber than Quintana, Lopez, Martinez, Sosa and Bernal? You must be kidding Mr. Hunter. Please stop smoking those cigarettes, please.! David, it’s nice to pick Yates, but the thrill will be whether MK keeps the jersey. I’d love to see the next level to your prognostic. Thanks. Surely Luke Rowe is Team Captain, not Kwiato.